But what ‘exactly’ is it? Change Management is in fact a structured approach for ensuring that changes are thoroughly and smoothly implemented, and that the lasting benefits of change are achieved. 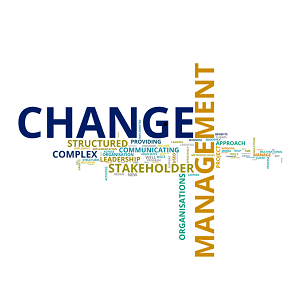 Change Management is a broad discipline that involves ensuring change is implemented smoothly and with lasting benefits, by considering its wider impact on the organisation, the people within it and the broader stakeholder group outside of it. Each change initiative you manage or encounter will have its own unique set of objectives and activities, all of which must be coordinated. These tools include, but are not limited to: The Change Curve, Lewin’s Change Management Model, McKinsey’s 7S Framework, SIPOC diagrams, Kotter’s 8-Step Change Model, Stakeholder Analysis and Stakeholder Management – and more specifically in relation to Associates who have specialised in Human Capital Management common Organisation Design methodologies and structures are used to help organisations design their Organisational Structures to align with Business Goals. Providing Change Management Leadership during a complex office relocation and consolidation project for a large multinational insurance company involving various internal and external stakeholder groups. Providing Change Management SME Support as well as Leadership on a multitude of new client implementation projects in a 3PL contract logistics environment – both on the Client as well as on the 3rd Party Logistics Service Provider side. Providing Change Management Leadership during a large-scale multifaceted global end-to-end supply chain transformation project for a leading multinational pharmaceutical organisation. Providing Change Management SME Support during a complex SAP implementation at a leading business conglomerate in the Middle East – 3,000+ users across multiple businesses in a variety of geographies. If you are interested to learn more please contact us to find out more about how we can best help your organisation Understand, Plan, Implement and Communicate Change, internally and externally, by developing and deploying an effective Change Management program.